Karma can sometimes be a harsh mistress. A man in Chicago experienced it almost instantly when he left his German Shepherd Dog locked in a hot truck on a day when the temperature outside was around 80 degrees. Luckily, this moron also left his laptop exposed on the front seat in an area where there had been a rash of car break-ins. Sure enough, a group of young men came by, looking in car windows, and spotted the laptop. They then smashed the window without realizing that a dog was inside. It’s lucky that they did or the owner may have lost something even more precious that day. The broken window probably allowed the dog to get some cooler air flowing into the truck, saving his life. The car owner came back about an hour later. That’s right, this idiot left his dog locked in a car for an hour when temperatures rose to 80 degrees. 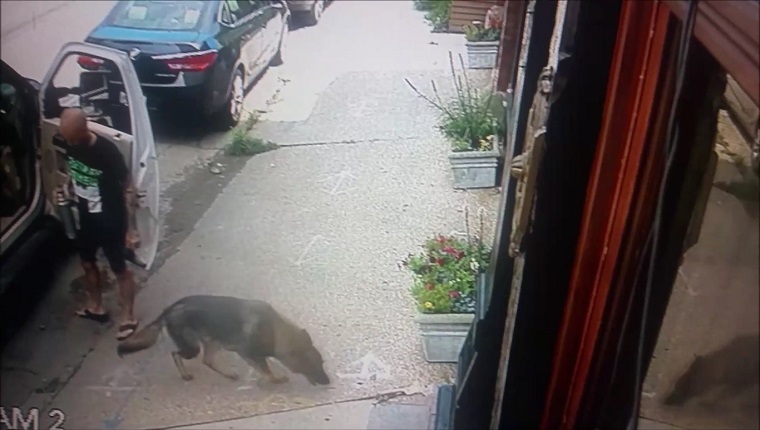 A nearby pub owner caught the incident on his security camera and said that he would have broken the window himself if he knew the dog was in there. Would you smash a window to save a dog’s life? Do you think this man got off easy by just losing a laptop that day? Let us know in the comments below!